Here are the two most difficult steps of baking a quiche: 1) making pastry dough; and 2) waiting for the quiche to be done while trying to ignore the tantalizing aromas emanating from the oven. 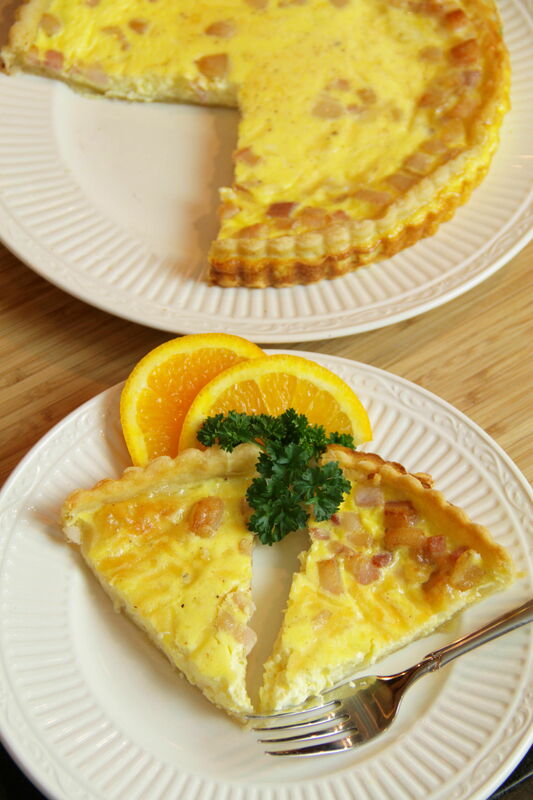 Quiches of all varieties are enticing, but I’m particularly fond of Quiche Lorraine – salty, smoky slab bacon baked with sultry Swiss cheeses. Slab bacon is quite easy to find these days. I picked some up at my local grocer, but you can just as easily ask your butcher for some. As far as the cheese goes, I recommend Gruyere or Swiss, but what I really like to do is blend the two together for even greater intensity. 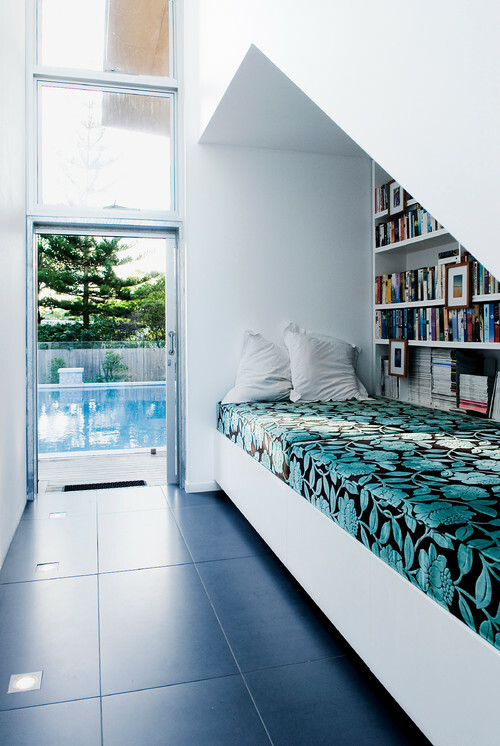 Hope you have enough patience to bake and wait for this tantalizing breakfast in bed! Preheat oven to 350°. Place pie crust into glass or ceramic pie dish. Cover bottom with parchment paper and set pie weights (or dried beans) on top of paper. Bake for about 10 t0 12 minutes, just to set. Remove from oven, discard paper, and set aside. 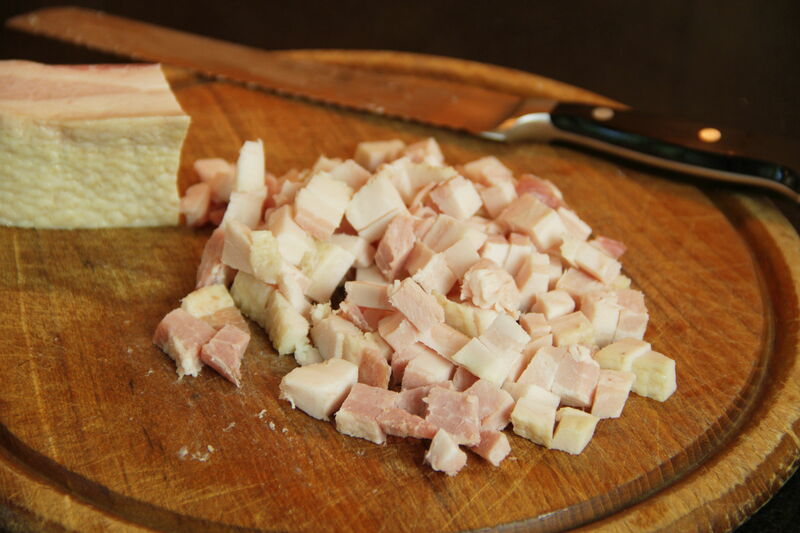 Chop bacon into small cubes. Cook in a heavy pan over medium heat until lightly cooked and fat is rendered, about 5 to 7 minutes. Remove from pan and drain on paper towels for a few minutes. 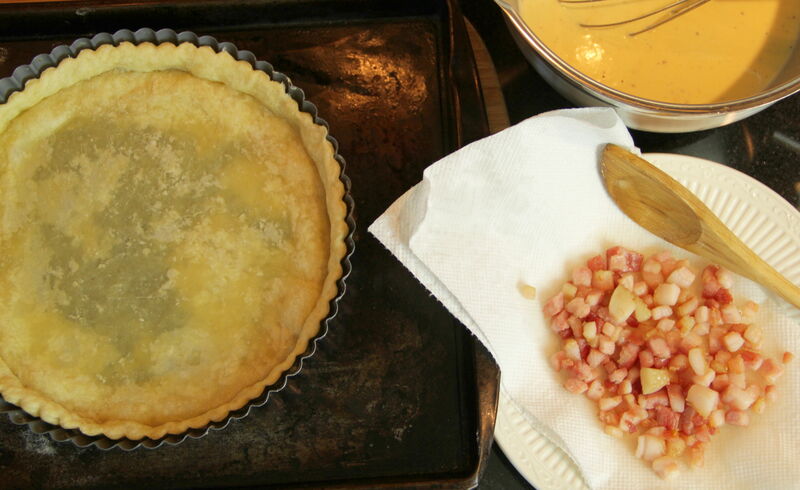 Spread cooked bacon evenly in bottom of pie crust. 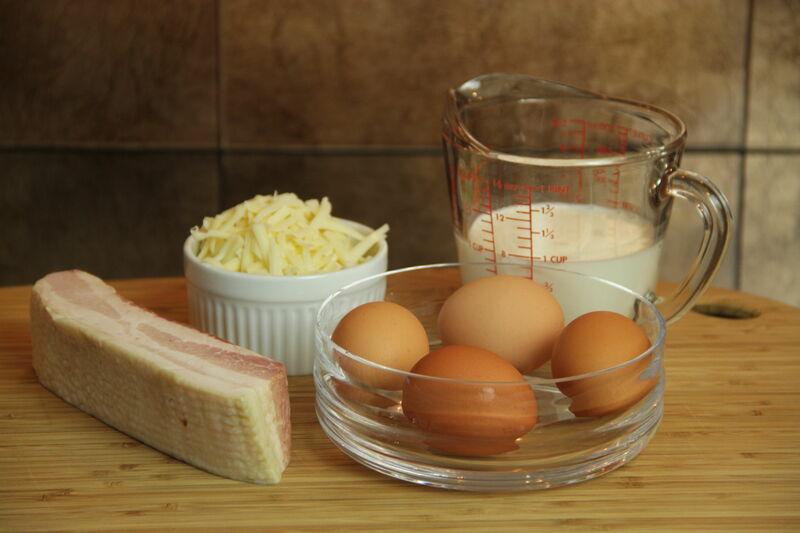 Layer cheese evenly on top of bacon. Break eggs into large bowl. Add cream and whisk until frothy, about 2 minutes. Season with salt, white pepper and nutmeg. 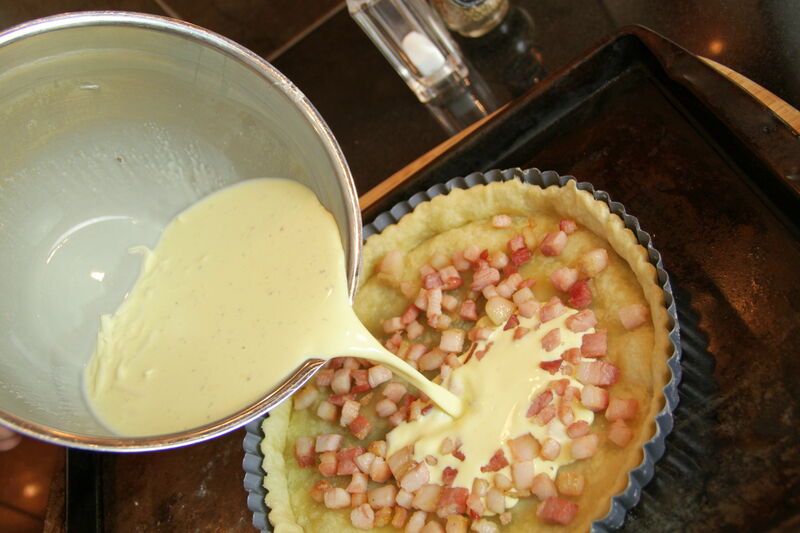 Pour egg mixture on top of bacon and cheese, filling to the top so that just the pie crust rim remains visible. Place quiche on a baking tray and then in oven. 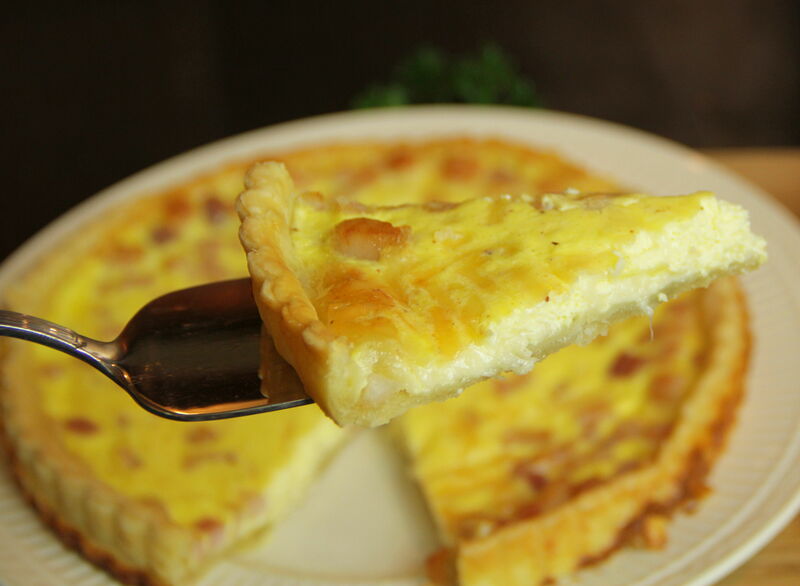 Bake for around 30 to 35 minutes, until a toothpick inserted in center comes out clean, and quiche is puffed up and golden. Allow to cool for 10 minutes before slicing. 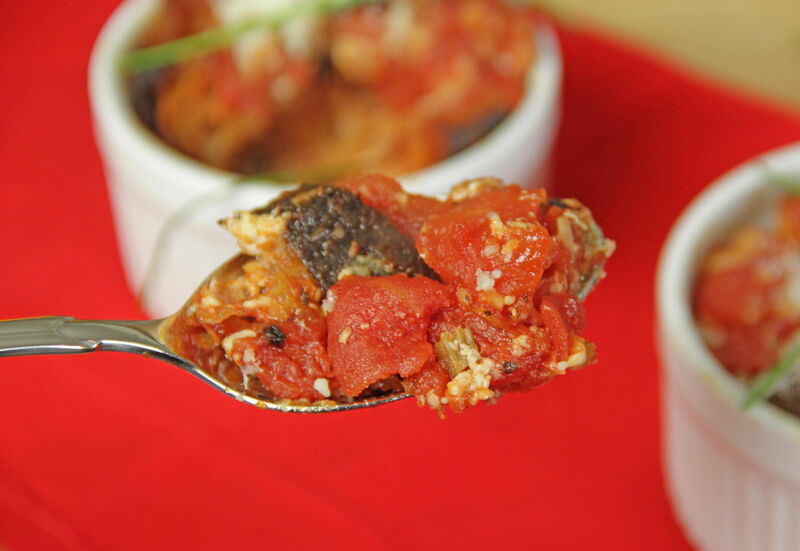 Serve hot, with fresh fruit or a salad on the side. 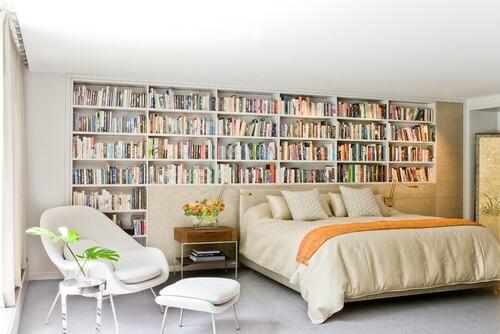 We just don’t read as many children’s picture books as we used to. My son constantly has his nose in a book these days so our reading together time has dwindled and is mostly limited to our bedtime chapter book reading. I was recommended this book and am glad I was. 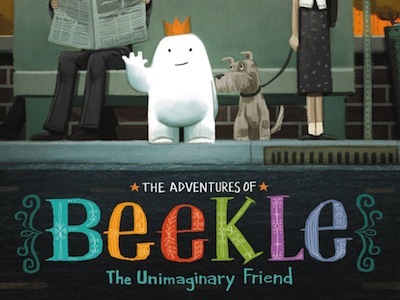 Beekle is downright adorable. He is a blobby, white little guy with a gold crown. He is an imaginary friend. Only, he hasn’t been imagined by anyone. All his friends that live in the imaginary friend land get imagined and sent to their new friends. But not Beekle. So he does the unimaginable: he takes matters into his own hands and heads out to find his match. I love this book. I love a unique story that is lovingly illustrated (author and illustrator Dan Santat was an illustrator of other children’s books before writing his own). This one was awarded the Caldecott Medal, which is America’s highest honor for an American children’s picture book. One look and you will know why. Lots of richly colored and fun to look at pictures make the book a delight to read for kids 3-6 and discriminating adults as well. Last week, I reviewed the third installment in the “Cornetto Trilogy”, three movies whose only relations to each other are the main actors and passing references to Cornettos, which, as far as I can tell, are the UK equivalent of the Drumstick ice cream cone. Having carried on about Simon Pegg and Nick Frost made me want to revisit the other movies in the “trilogy”. First up was Hot Fuzz, mainly because it’s available on Netflix. Nicolas Angel (Simon Pegg) is one of the best cops in London but he’s a bit uptight and a bit of a killjoy. So when he is transferred to a sleepy bucolic village, he is less than enthused. When he discovers his partner Danny (Nick Frost) is the same man he arrested for trying to drive drunk, he is beside himself. Things begin to change when a series of murders, crudely disguised as accidents, begin to occur. Nicolas is the only one to smell something fishy but when he gets Danny in his corner, dark secrets of this sleepy town begin to come to life. Hot Fuzz is a fun, action-packed full-blown cop movie, with winks and nods to plenty of genre movies, like Bad Boys II. You can tell they have a bigger budget and are having fun shooting and blowing up as much as possible. There are a few violent scenes which are almost cartoony but if you are squeamish, be ready to cover your eyes. Overall it’s a funny and exciting movie and a good way to begin your weekend. If you’re a fan of the grilled cheese sandwich / tomato soup combo, you will love this old-fashioned treat straight out of the annals of Grandma’s recipe book. As children, my sister and I were amazed by the first bite of shockingly sweet pudding-like tomato bread, followed by the verge to savory with a finish of glorious melted cheese. Our grandma would make us each an individual dish, which we would gobble down for breakfast, lunch, dinner or anytime in between. I like to make my own croutons for this recipe. Make extra for salads or stuffing. Drop the herbs and garlic for a more puddingly sweet version, or skip the sugar for an old-fashioned breakfast in bed even Grandma would approve. 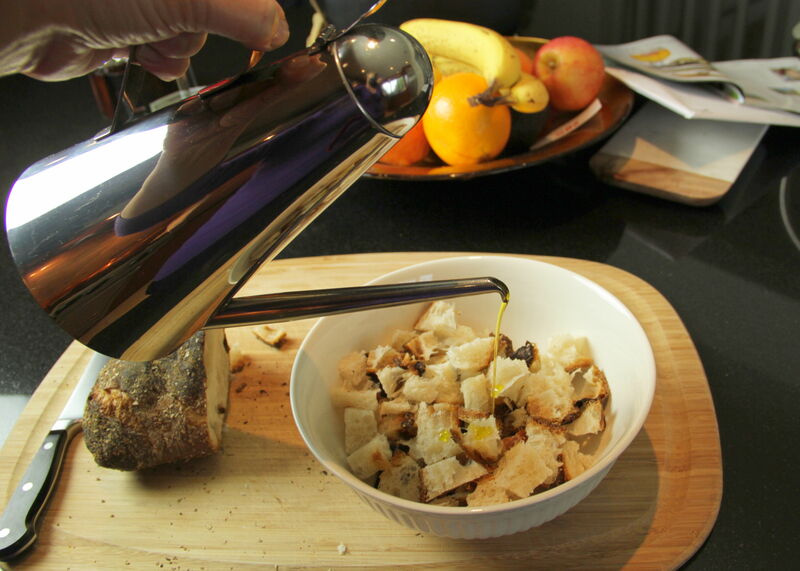 To make croutons, preheat oven to 350°. Cut bread into ½-inch cubes. Toss with 3 tablespoons olive oil and stir in basil, oregano and parsley. Spread out on a baking sheet and bake until crisped, stirring occasionally, about 20 minutes. Spray 2 small ramekins or baking dishes and set aside. Fill a heavy pot with enough water to cover tomatoes and bring to a boil. Blanch tomatoes for less than one minute. Remove tomatoes from water, cool, and peel off skins. 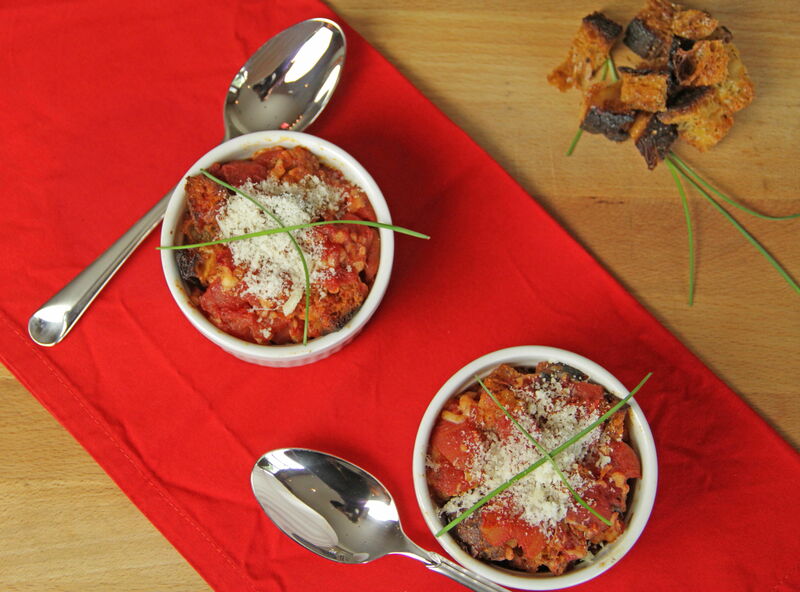 Chop tomatoes into small cubes, and allow to drain, reserving tomato juice. Heat remaining 1 tablespoon olive oil in heavy saucepan over medium heat. Add garlic and sauté until golden, 1 to 2 minutes. 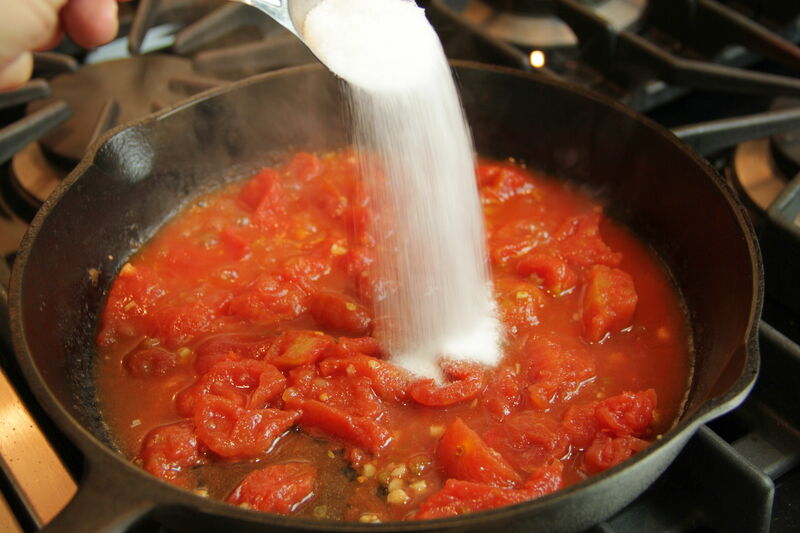 Add tomato, sugar, salt and pepper. Cook until lightly bubbling, then reduce heat and simmer for 25 to 30 minutes, adding reserved tomato juice if sauce becomes too thick. Remove from heat. 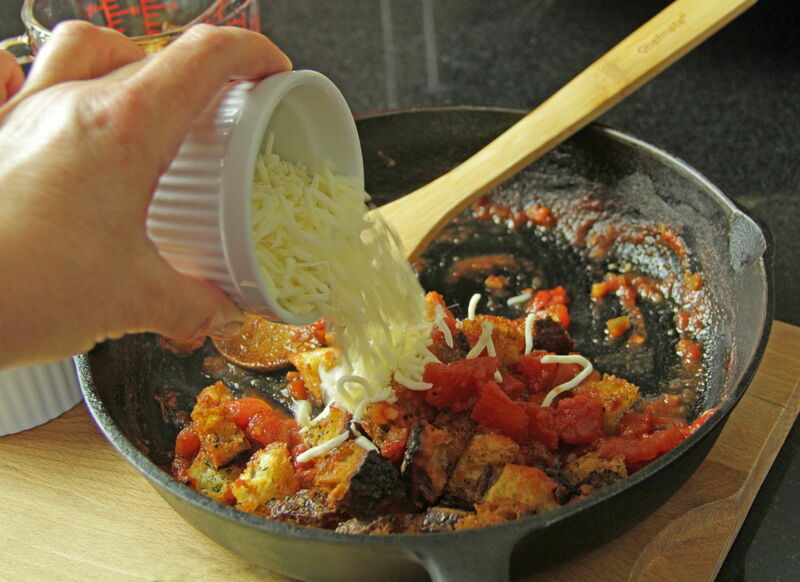 Toss croutons into tomato mixture, stir in cheese, then scoop into prepared ramekins. Bake in the oven until hot and bubbling, about 30 minutes. Garnish with fresh chives and serve hot.